Soon after The Force Awakens brought the global box office to its knees, and attention slowly began to turn toward Rogue One and Rian Johnson’s Star Wars: Episode VIII, it was confirmed that all of the core cast would reprise their roles for the director’s mainline installment. Pegged to arrive in late 2017, production is well underway on the space-faring sequel, and as one of the biggest films currently in development, set photos continue to find their way online. 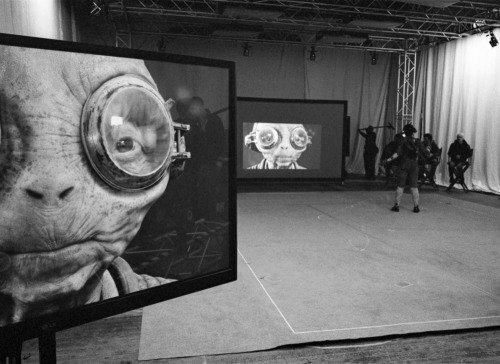 However, in this instance, the latest teaser for Episode VIII arrives directly from the horse’s mouth – Rian Johson’s Tumblr page (thanks, /Film), with a new still teasing the return of Lupita Wyong’o’s all-powerful Maz Kanata. Arriving without a caption, the still appears to be taken on a performance stage, with a filming crew spotted in the far right-hand corner. One thing worth bearing in mind is that Johnson’s image could be taken from the set of The Force Awakens, essentially to coincide with the film’s imminent Blu-ray release. As the ending of The Force Awakens confirmed, it looks set that Episode VIII will revolve around Luke’s mission to the first Jedi temple, not to mention how his fabled lightsaber winded up in an old treasure chest deep within Kanata’s castle on Takodana. In related news, according to British tabloid The Sun, actor and comedian Ade Edmondson is circling an “eccentric” role in Star Wars: Episode VIII. Take that with a pinch of salt, however, with Disney and Lucasfilm yet to announce anything official. Hypothetically, though, Edmondson could well be on the road to joining forces with fellow newcomers Benicio Del Toro, Laura Dern and, potentially, Gugu Mbatha-Raw when Star Wars: Episode VIII shoots for theaters on December 17, 2017.